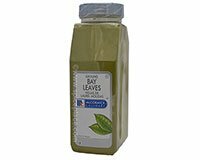 McCormick Ground Bay Leaves are an excellent way to infuse bay leaf flavor in soups, sauces, marinades, and other dishes without having to find and remove the bay leaves from the recipe before serving. In addition, you may use Ground Bay Leaves as a replacement for whole bay leaves in any recipe by using 1/2 tsp ground bay leaves to equal 6 small whole bay leaves (or a little less that 1/8 tsp ground bay leaves to 1 large whole bay leaf. Note that Ground Bay Leaves are not completely interchangeable with Whole Bay Leaves in a recipe as the whole leaves are removed when cooking is completed; the ground bay leaves cannot be removed and the flavor continues to build. So ground bay leaves are suitable for foods that are served immediately and without leftovers. Bay Leaves have a distinctively strong, aromatic, spicy flavor. Bay Leaves have a pleasant, slightly minty menthol aroma. The elliptically shaped bay leaves are light green in color and brittle when dried. Bay Leaves are the dried leaves of the evergreen tree, Laurus nobilis. Bay Leaves are also frequently referred to as "laurel leaves", though bay leaves is the approved name. Bay Leaves are indispensable in flavorful cooking especially for soups and stews. Usually one or two whole bay leaves are usually enough as the flavor strength increases with the amount used and the cooking time. Ground bay leaves have numerous uses in marinades, soups, stews, shellfish, tomato dishes, meats, potatoes, and sauces. Bay Leaves are widely used throughout the world and are an especially important ingredient in French, Italian, Indonesian, Latin American, Caribbean, and the Mediterranean cooking. Ingredients: Ground Dehydrated Bay Leaves.